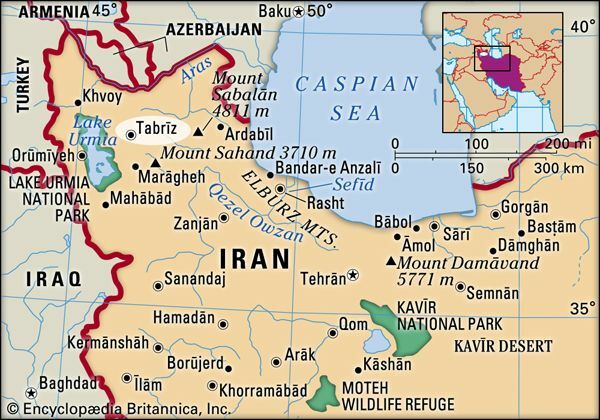 Tabrīz, Persian Tauris, fourth largest city of Iran and capital of the East Āz̄arbāyjān province, lying about 4,485 feet (1,367 metres) above sea level in the extreme northwestern part of the country. The climate is continental: hot and dry in summer and severely cold in winter. The city lies in a valley surrounded by hills on three sides. It is in an earthquake zone that is liable to frequent and severe shocks. Tabrīz, IranTabrīz, Iran. Encyclopædia Britannica, Inc. The name Tabrīz is said to derive from tap-rīz (“causing heat to flow”), from the many thermal springs in the area. Also called Gazaca, Tabrīz was the capital of Atropatene, named for Atropates, one of Alexander the Great’s generals. It was rebuilt in AD 791 after being destroyed by an earthquake. Similar disasters followed in 858, 1041, 1721, 1780, and 1927. Tabrīz was made the capital of the Mongol Il-Khan Maḥmūd Ghāzān (1295–1304) and his successor. In 1392 it was taken by Timur (Tamerlane), a Turkic conqueror, and some decades later the Kara Koyunlu Turkmen made Tabrīz their capital. Under their rule the city’s Blue Mosque was built. Tabrīz retained its administrative status under the Ṣafavid dynasty until 1548, when Shāh Ṭahmāsp I moved his capital westward to Kazvin. During the next 200 years Tabrīz changed hands several times between Iran and Turkey. The Russians occupied it in 1826, and the Bāb, the founder of the Bābī religion, an Islamic sect and forerunner of the Bahaʿi faith, was executed here, together with thousands of his followers, in the 1850s. In 1908 Tabrīz became the centre of the Nationalist movement. During World War I, Turkish and then Soviet troops temporarily occupied Tabrīz. The city was again occupied in World War II, this time by Allied troops protecting military supply routes running through Iran and into the Soviet Union. Though all parties had agreed to withdraw after the war, the Soviet Union increased its presence and helped a separatist movement establish an autonomous region in Azerbaijan, with Tabrīz as its capital. Iran and the Soviet Union reached an agreement in March 1946 that called for the withdrawal of Soviet troops in exchange for the creation of a joint-stock oil company. 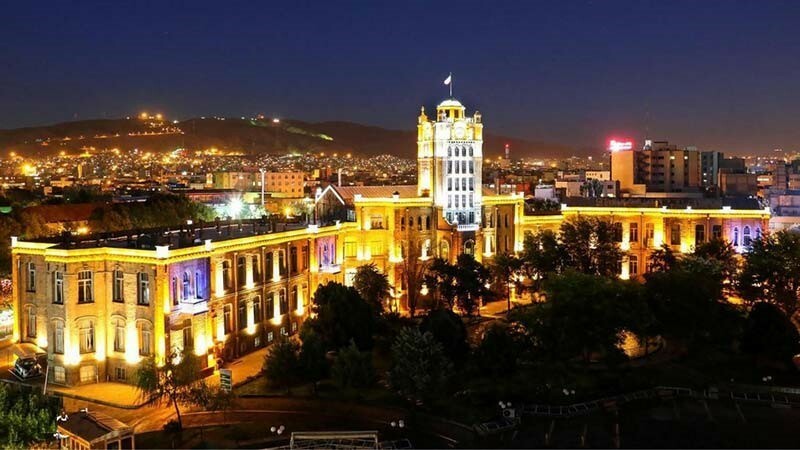 The city continued to play an important part in Iranian politics into the 21st century. Tabrīz has several notable ancient buildings. The Blue Mosque, or Masjed-e Kabūd (1465–66), has long been renowned for the splendour of its blue tile decoration. The citadel, or Ark, which was built before 1322 on the site of a collapsed mosque, is remarkable for its simplicity, its size, and the excellent condition of its brickwork. Also noteworthy are the remains of the 12-sided tomb of Maḥmūd Ghāzān, ruler of the Mongol dynasty in Iran. The modernization of Tabrīz has quickened since World War II, with streets widened, buildings erected, and public gardens laid out with fountains and pools. The city’s newer buildings include a railway station and Tabrīz University (1946). Just outside the city is a summer resort. Tabrīz is commercially important, and the principal products include carpets, textiles, cement, agricultural machinery, motorcycles, and household appliances. The city is linked by rail with Tehrān and with areas to the north, and it has an airport. Pop. (2006) 1,398,060.